Obviously everybody is different and that being the case, individuals need, want and require varying levels of support. So being able to cherry pick from a list of helpful sources is a good place to start. Whatever you do: DON'T GO IT ALONE! When you look for some support, try to connect with people who are positive and who you can get along with. Not necessarily just like you. If you're going through some tough times that are making you feel very negative about the world around you, misery does love company but commiserating with those negative people might not be what you need at all. And, if you can get along with a person or group, the better chance you'll have of sticking with a therapist, support group or whatever avenue you choose. 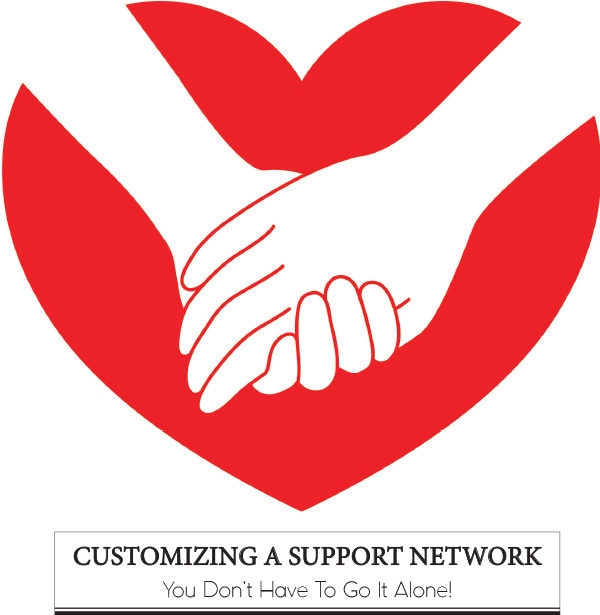 Here are some places to start so you can customize a support network. If you want to stay anonymous for a while or are just looking for some answers to questions that those around you don’t know, there are many sources on the Internet. -Understand that much of the information, especially in “Forums,” is pure opinion. Look for several sources to verify what appears to be someone’s opinion before you take it for fact. -Go to websites that have been around for some time – are established - and that appear to be objective without an agenda. That is where your best information will be. Steer clear of a site that is trying to sell something. -Make sure websites with “Forum,” “Blog” and “Chat Room” areas have an active moderator. The moderator’s job is to eliminate or question misinformation and to block posters who continually misinform. Especially in major metro areas, it's possible to find many support groups that meet frequently and groups where members are anonymous, if that's important to you. The help, advice and support can be fantastic. To see if a support group meets in your area, call or check into an AIDS Service Organization or call a hotline. While a hotline really shouldn't be considered an avenue for regular therapy simply because you might be hogging it from someone who is calling in a crisis situation, most can be accessed as a source of a referral. Keep a local or state number handy - the calls are as anonymous as you want them to be. One of your first steps is going to be selecting a doctor or physicians practice. You will want to select a doctor who specializes in HIV care and treatment. This is important because the doctor you choose will need to be in tune with the latest treatments, which of those treatments will benefit you most, drug interactions and everything else associated with HIV specifically. Your first HIV regimen is your best shot so you’ll want someone that is in the know. Make sure you have a good rapport with your doctor and make sure that you get along well with the staff also. There are many times when you might be seeing a physician’s assistant or a staff nurse. Aside from your primary care physician, you and your doctor may decide that other medical professionals should be involved. These professionals might include a psychologist, therapist, dietician and physical therapists or other therapies like massage and acupuncture. All of these people should be in tune with people who are HIV positive. Don't forget about or discount the expertise of your pharmacist! They can be of great importance with drug interactions - even those of herbal supplements, your insurance for co-pays and more. Larger pharmacy chains like Walgreens have pharmacists specifically trained in the area of HIV treatment. There is a tremendous amount of free knowledge and help of all kinds available to you if you choose to take advantage of it. The first place that you should go to is an AIDS Service Organization in your area. ASOs, usually depending on the size of the area served, can offer you services like case managers, social workers and benefits counselors who can navigate the red tape associated with getting any benefits you might be eligible for and also help you locate transportation and housing if you need that. Many ASOs also have food pantries. The professionals and volunteers at ASOs can recommend doctors and other health care providers who deal with HIV patients and are nearby. There are also support groups of different kinds that meet regularly. Community Based Organizations are similar to ASOs and offer many of the same services. CBOs might be more comfortable for some because being “community based,” they many times serve a particular community such as African American or Latino, for instance, that is more familiar for them. Faith Based Organizations have really come a long way in most areas. While some churches still are closed-minded to HIV there are many, even in smaller metropolitan areas, that have gotten over the stigma. Most spiritual groups and churches that are HIV-friendly offer an HIV support group and individual counseling. Your ASO should be able to refer you to a Faith Based Organization near you. There’s no substitute for having a family member or life-long friend in your corner. Someone to confide in, someone you know you can count on. Friends and family can help you in areas where others in your support network can’t. They can go to doctor’s appointments with you and be your sounding board because they know all about you. Make sure that you are ready to tell them that you are HIV positive and also be as sure as you can be that they are ready to hear it. Remember that there is still a stigma associated with HIV to many so make sure the time is right. If it’s not the right time to let those close to you know, try to start with a peer or support group. You’ll find people in the same boat as you and will probably find new friends and relationships there. In the case of a crisis at any time there is always help from regional, state and national HIV Hotlines. To find a listing of those hotlines go to our website at www.hivpositivemagazine.com/hotlines.html and call for help.